Even as early as the beginning years of the 1900s, Canadian teams took to importing players, especially pitchers and their batterymates from teams south of the border. Bert Orr was an exception. He was a Canadian hurler, from Virden, Manitoba, and was sought out by many teams, both in Canada and the United States. Orr, and his Virden catcher, H.A. "Jersey" Crew became familiar in the area as hired guns on teams mainly in southwest Manitoba and along the C.P.R. mainline in the District of Assiniboia, N.W.T. (for example Regina, Moosomin, Broadview, Qu’Appelle and Indian Head). It was rare event when a photo, or a sketch, of a player appeared in the local papers. The Winnipeg Tribute did just that in the summer of 1902 in saluting the young pitcher. The caption for the photo - "MR. BERT ORR, A STAR PITCHER". Virden, July 24 - Mr. Bert Orr has born in the city of Toronto and is about 22 years of age. He learned to play ball in that city. His first ball playing was in the Junior Crawfords from there into the Wellingtons and then he pitched for the Ramblers in the Island League, a senior team. He and Crew came to Virden five years ago and since that time has played with the Virden team. He has had a remarkable record since coming to Manitoba. He has pitched 43 games and only lost three of them, something any amateur pitcher can be proud of. He holds the strike-out record of the province of Manitoba in a ball game. He struck out 21 men in a game against a picked team last year in Winnipeg. It is very doubtful there is a pitcher in Canada his equal playing amateur ball. He is manager of J. R. Duke's gents' furnishing store. In chasing down more of the story of Bert Orr, we ran into the story of Jimmy Archer. Orr and Archer were the battery for Virden in 1902 and part of 1903. Archer went on to become a celebrated catcher in the majors with the Chicago Cubs. 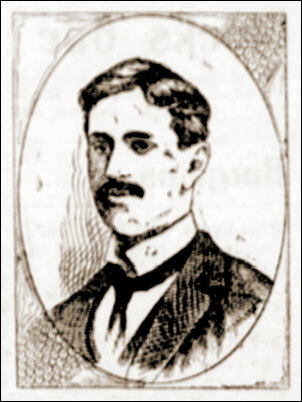 Born in Dublin, Ireland, Archer moved to Montreal, then Toronto where he played ball at St. Michael's College and in the Toronto City League before heading out to Virden, Manitoba after a serious workplace injury which may have had a major positive effect on his career as a catcher. Working at a firm which made wooden barrels, Archer fell into a vat of boiling fluids and suffered serious burns to his right arm and side, down to the knee. He was in hospital for three months. He recovered, but found his right arm was now shorter than his left, perhaps from a shrunken tendon or scar tissue. Nonetheless, he discovered he had additional power in his throws and could throw from his crouch or squat position with power and accuracy. His unique style had him hailed as "The king of all big league backstops" and "The greatest backstop in the game". 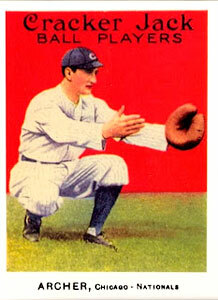 He became the Cubs star catcher in 1909 and played with the club for nine seasons. In 1990, Archer was inducted into the Canadian Baseball Hall of Fame.